Hi, my name is Andrew and I work at the new Music & Arts location in Westborough, MA. My journey began here in December of 2015 when Music & Arts became the owners of Robinson Music, a music store I worked at for about a year. Since the transition I've had the pleasure of learning about a lot of new products and musical gear in our expanded inventory. I've also been very happy to see the legacy and community-dedication of Robinson Music be preserved in the Music & Arts philosophy. I began my musical career with the recorder in third Grade and alto sax in fourth. My primary instrument is tenor saxophone, which I've played since high school. In college, I played lead tenor in the jazz band and also ran my own jazz combo class. In addition to jazz, I play ska, reggae, blues, rock, and punk with friends. In my free time I practice piano and recorder. Having been a musician my whole life, I feel right at home working in a Music & Arts store. I am surrounded by products that I know and love. 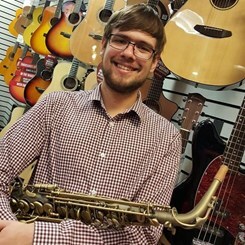 So whether I'm helping a new student find their first instrument or a seasoned player discover something new, it is always a pleasure to use my experience and expertise to aid a fellow musician!